Blackjack Scratch Card Review - Casino Answers! Blackjack is an instant win scratch card game developed by Playtech. 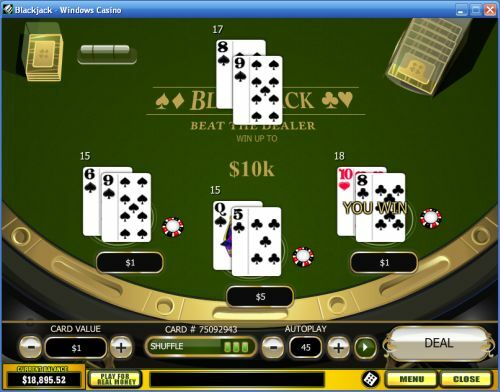 You can play the Blackjack online scratch card game at Bovada. The Blackjack casino game is a dime scratch ticket. Bets on the Blackjack scratch-it game are $0.10, $0.20, $0.30, $0.40, $0.50, $0.75, $1, $2, $3, $4, $5, $10, $15, $20, $25, $50, $75 and $100 per scratch card. The Blackjack scratch card has a betting range good enough for any scratch card player. To play the Blackjack instant win lottery game, press the “Play” button to begin. You can then either press “Scratch All” to scratch the entire card or click on each object to scratch them yourself. The dealer will then deal you two cards per hand – one face up and one face down. He will also deal himself. The object is simple if you’ve ever played Blackjack in your life – one or more of your hands has to beat the dealer’s hand without going over 21. You can’t hit and receive a third card – two cards is all you get. If your hand beats the dealer’s, you will win the prize listed below your hand. The highest payout on the Blackjack scratchie is 10,000X your bet. By winning a hand of blackjack with the top payout listed underneath, you will win that prize. You can win up to $1,000,000 playing the Blackjack scratch card at Bovada! The Blackjack instant win lottery ticket has a basic autoplay mode. Use the “+” and “-” buttons under “Autoplay” to select from 1-99 autoplay games of the Blackjack scratch card. To start the autoplay mode on Blackjack, simply press the Play button. Press the Stop button to stop the Blackjack scratch card autoplay feature at any time. Blackjack does a great job of taking the game of Blackjack and making it into a scratch card. If you look at the table, it looks just like a Blackjack table rather than a scratch card. You can play the Blackjack scratch and win lottery game at Bovada! Are USA residents allowed to play the Blackjack scratch ticket for real money? No, American players cannot play Playtech’s Blackjack scratch card. However, USA players can read our 5 Diamond Blackjack Scratch Card Review and play it at Bovada. Can I play a free flash game of the Blackjack scratch game? Yes, an instant play version of the Blackjack scratch & win game is available to play for free or real money at Bovada. Download the latest version of Adobe Flash Player for best possible performance.